Any chef worth their salt will admit that beloved recipes leave just enough room for improvisation and interpretation. Like recipes that feed the body, great Christian melody feeds the soul, and Seattle horn man Rulon Brown is dishing up flavorful classics. His new EP, Rejoice, updates the recipes of four 19th Century Christian melodies with dashes of global-rhythm and a zest of pop. 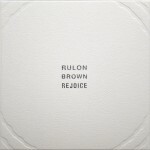 Like any well-balanced dish, Rejoice pairs Rulon’s spry sax and flute playing with the tender crooning of Ryan Shea Smith, bass grooves from Jon Hamar and spicy rhythms from drummer Jeff Busch. Fans can listen to Rejoice online and pre-order a signed limited-edition CD. Each CD comes in an origami-inspired folding case designed by celebrated book maker John Hubbard “ESON.” The design fuses silver inks, heavy emboss textures and John’s trademark minimalism. Orders start shipping on July 11. Rulon’s sacred music is attracting audience quickly. This summer, the Faith Film Festival in New York and Fear No Film Festival in Salt Lake City, Utah will premier a documentary about Rulon’s journey into sacred music, by filmmaker Aaron Bourget.